where they infect only neurons and express the encoded protein in a highly circumscribed region of brain. By overexpressing the protein, and by expressing an inhibitor of the protein, it is possible to both mimic and block the drug- and stress-induced change. 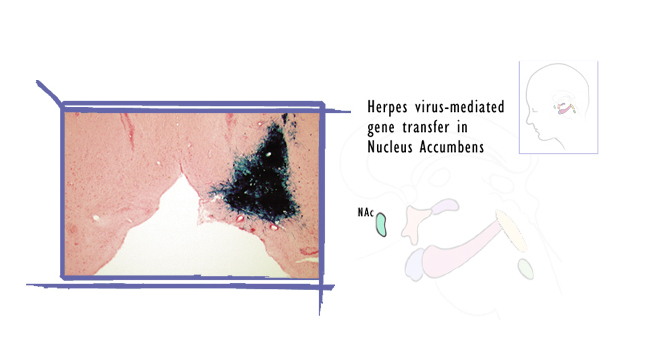 Viral-mediated gene transfer is used in both rats and mice. We use the tetracycline gene regulation system, which is a two-gene system. One gene expresses the tetracycline transactivator (tTA), a tetracycline inhibitable transcription factor, under the control of some neural promoter. 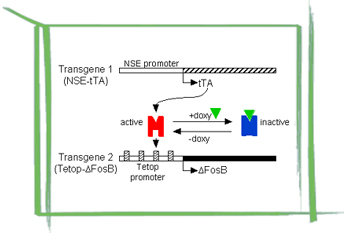 The other gene expresses the protein of interest under the control of the Tetop promoter, which is activated by tTA. This is an inducible system, because when bitransgenic mice are maintained on the tetracycline derivative, doxycycline, gene expression is off and can be turned on in adult animals by removal of the doxycycline. This is also a cell-type specific system, because the protein is expressed only where tTA is expressed and this can be controlled by the neural promoter used to drive it. We also use the Cre-loxP system, in which a gene of interest is engineered to contain loxP sites flanking a critical region of the gene. A mouse containing the “floxed” gene is normal, because the loxP sites are silent. Upon expression of the Cre recombinase, which removes DNA sequences flanked by loxP sites, that gene is inactivated. We use three methods for inducing Cre in a region-specific manner in brain. In one, we breed mice containing a floxed gene to mice in which Cre is inducibly expressed under the tetracycline system described above. In the second, we breed them to mice that express modified forms of Cre, which can be activated upon local injection of a chemical in brain. In the third, we use viral vectors encoding Cre to create localized knockouts of the floxed gene. Together, these various approaches enable us to exert powerful control over a drug- regulated protein. 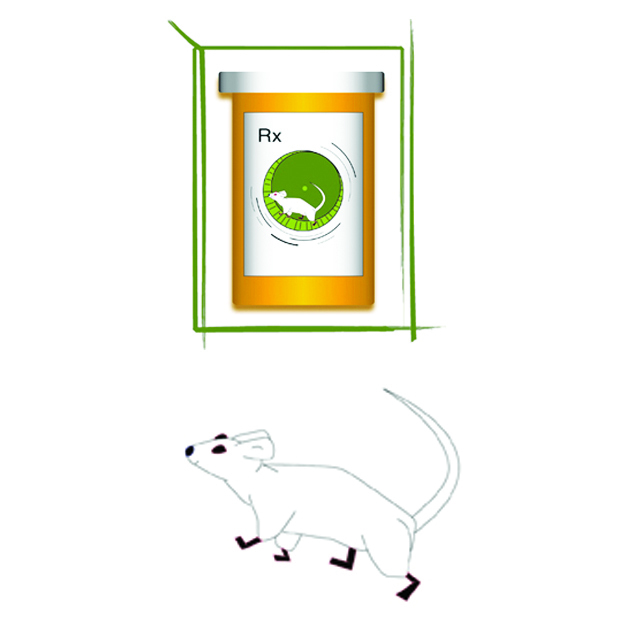 One of the major objectives of this Program Project Grant is to define the transcriptome and epigenome of stimulant and opiate addiction within the brain's reward circuitry and to use this information as a foundation from which to define novel mechanisms of neural and synaptic plasticity that control the addicted state. We use ChIP-Seq (chromatin immunoprecipitation followed by high throughput sequencing) to define, genome-wide, the range of chromatin modifications that are induced by drugs of abuse in specific brain reward regions. We also use RNA-Seq to identify, genome-wide, all RNAs whose expression levels are altered in these same regions in response to chronic drug exposure. A major feature of this work is the advanced bioinformatic analyses that are required to optimally mine the vast amounts of such data generated by our research. Program Project Grant investigators have led the field in genome-wide gene and chromatin analyses within addiction models, including pioneering these approaches in brain, which offers several unique technical challenges. The figure shows the range of genes induced in nucleus accumbens in response to a challenge dose of cocaine in three groups of animals: drug naïve (acute), those that received prior chronic treatment with the drug (chronic), and those that received prior chronic treatment followed by a week of withdrawal (chronic+WD). Note how some of the genes induced acutely are no longer induced in cocaine-experienced animals. These genes are desensitized. At the same time, note how close to 3-fold more genes are induced by cocaine in experienced animals. These genes are sensitized. Program Project Grant work has shown how chromatin modifications mediate such gene desensitization and priming. To understand the relationship between a particular drug- or stress-induced molecular change andaddiction or depression, we study animals, in which the molecular change is mimicked or blocked, in behavioral models of these disorders. Accordingly, our research group maintains a Behavioral Testing Core Facility, which offers a wide battery of behavioral tests in rats and mice. In addition to assessing the general neurological function of the animal, we have tests that measure drug and non-drug reward (including sexual and feeding behavior), depression- and anxiety-like behavior, and cognitive function. More sophisticated tests of addiction, including drug self-administration and animal models of relapse, are also available. Together, we can formulate highly specific hypotheses concerning how a change in a particular protein within a given brain reward region causes certain aspects of addiction. Our Program Project Grant faculty use state-of-the-art neurophysiological recording techniques—including recordings from identified neurons in vivo and in brain slices—to characterize the many types of changes that drugs of abuse induce in the electrical excitability of their target neurons. Such functional plasticity encompasses changes in the intrinsic excitability of whole neurons (sometimes referred to as homeostatic plasticity), as well as changes in the efficiency of individual synapses (referred to as synaptic plasticity, such as long-term depression and long-term potentiation). There is now considerable evidence—much from this Program Project Grant—that stimulant and opiate drugs of abuse induce both major forms of plasticity in neurons that comprise the brain's reward circuitry and that these plastic adaptations are important mediators of the behavioral abnormalities that define a state of addiction. 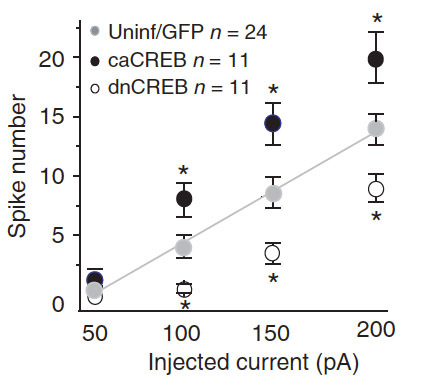 The figure shows that medium spiny neurons of the nucleus accumbens show greater intrinsic excitability upon activation of the transcription factor, CREB (caCREB), and less excitability upon blockade of CREB (dnCREB). Our Program Project Grant has, over the past decade, been instrumental in demonstrating that activation of CREB in this brain region, via increasing the excitability of these neurons, mediates tolerance and dependence to stimulant and opiate drugs of abuse. Optogenetics describes the ability to regulate the activity of a protein with light. In its most commonly used version, mutant forms of non-mammalian ion channels or pumps that are activated by specific wavelengths of light are expressed in neurons and used to control the activity those cells in vivo. In this way, it is possible to directly demonstrate what role a particular change in neuronal activity plays in the addiction process. Program Project Grant faculty are leading the field in using optogenetic tools to decipher the neural circuitry of addiction. The Transgenic and Molecular Core is headed by Li Shen (Mount Sinai). This Core includes advanced bioinformatics and chromatin methods. The Behavioral Core is headed by Vanna Zachariou (Mount Sinai). Bill Carlezon (Harvard) augments the behavioral assays available to Program Project Grant investigators. This Core also includes a wide range of viral vectors.